Photo by Wendy Chan Gather ye huckleberries while ye may. And make scones. The sun was still warm on a crisp November afternoon. With buckets and gloves, we were on our fourth huckleberry picking trip of the season. Surrounded by fresh air and natural beauty, I felt so fortunate to call Humboldt my home. Living on the North Coast, we can start picking the huckleberries as early as August and continue until right about now. At peak season, the bushes are loaded around the Trinidad and Westhaven area. I know it takes a lot of effort to pick a few pounds but the rewards are tremendous. Since my friends introduced me to huckleberries a few years back, it has become a tradition for my family and friends to pick for fun on a weekend. "Wow! This brush has so many!" one kid called out. "Found the blue ones here, they're almost like blueberries," my friend exclaimed. I found a huge bush full of blue huckleberries on our last trip and spent a good half hour picking them. Picking, hiking and laughing, our buckets were getting heavy but we're always reluctant to end the trip. On our way home, we talk about the recipes and the goodies that the berries will bring. Freezing them in a single layer on baking sheets means we can store them for months. We have enjoyed pies, pancakes and tarts with them but the scones are my family's favorite. My son even requested them for the last few school bake sales. For me, nothing is better than having fresh huckleberry scones on a Sunday afternoon and Christmas morning with my boys. I feel satisfied and my kids appreciate them more after the hard work of picking and cleaning the berries. 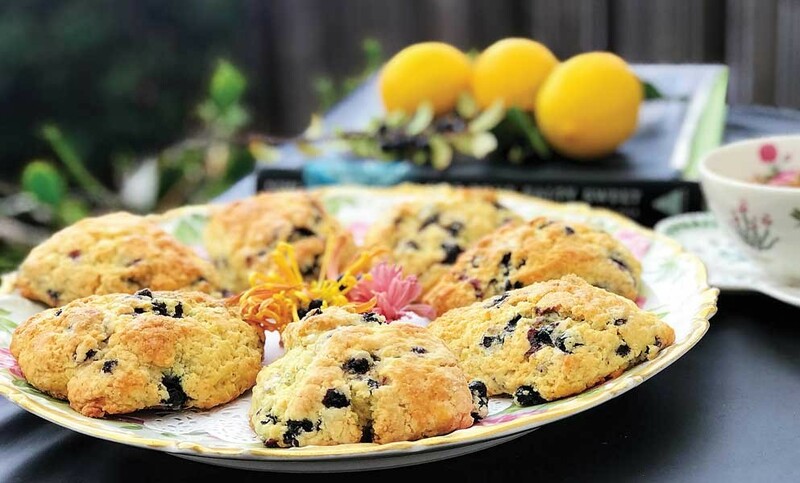 For years I have tested many scone recipes and I've finally come up with my favorite. The secret is the fresh berries, a little homemade lard and almond flour. These aromatic, flaky and creamy scones are what I like to serve when family and friends come over for tea and the holidays. In a large mixing bowl, combine both flours, sugar, salt, lemon zest, baking powder and soda. Mix well. Add the lard and grated butter, rubbing it in with your fingers until it's fully incorporated into a coarse, crumbly meal. In a small bowl, mix the cream and eggs together, reserving 1 tablespoon of the cream. Pour the egg and cream mixture into the flour and butter mixture. Use a spatula to mix until just blended. Gently fold in the huckleberries until they are distributed. Pour the dough onto a well-floured cutting board. Gently knead and pat the dough into a flattened ball. Cut the dough into 8 wedges. Brush the top of the scones with the reserved egg wash. Let them rest in the refrigerator for at least 15 minutes. Heat the oven to 400 F. Place the scones spaced apart on a baking tray with parchment paper and bake for 20 minutes. Meanwhile, make the glaze by mixing the juice of a lemon and 1 cup of powdered sugar plus the reserved cream. Once the scones are out of the oven, allow them to cool on a rack for 10 minutes. Drizzle on the glaze. Enjoy with tea and a friend.